Mom, the Intern: Ten months, a little late. Ten months, a little late. Clara the Bean officially reached her 10-month milestone on Saturday ... or was it Sunday? There is no 29th of February this year, so I guess March 1 is it. That means I'm only two days late on this post. Not that anyone was counting. This pose ... I die. As you can plainly see, Clara is as adorable as ever, crawling around, pulling up to stand, yammering all day, waving and clapping. She officially has one full tooth on the bottom, which makes her look like a cute little Jack-o'-lantern. The other bottom incisor, plus the top two, are also coming in -- albeit slowly. But they've officially broken through the gums which means we have our happy baby back! No more crying and fussing all day! No more sleepless nights! I feel like a new woman. Since she's got teeth and a desire to chew her food, I've introduced some soft solids to her diet. Black beans, peaches, pears, Mandarin oranges, noodles, sausages, oatmeal ... stuff up that alley. She seems to like everything right now or at least be willing to try it. A breath of fresh air, considering her big brother is in the middle of his Picky Preschooler phase. Still can't get her to take water no matter how many methods I try -- the next step is forcing it with a syringe but I feel like that might be taking things into Control Freak Territory. Help me see reason here, people. I need suggestions. Don't worry, I'll be pleading for them again by the end of this. I recently read that introducing peanuts frequently between 4 and 11 months can reduce a child's likelihood of becoming allergic to peanuts. So about every other day, I give Clara a spoonful of peanut butter. She definitely takes after both parents because she loooooves it. No allergic reactions so far. It's a good source of protein, too. Clara adores her siblings and her daddy. She just lights up whenever they enter the room and especially when they interact with her. When Dill calls, I put him on speaker so she can hear his voice and she goes nuts. Of course she loves me, too, but that goes without saying. I'm still breastfeeding about four times a day. The feedings are waning in frequency as they typically do at this age. But she still loves her "nursies." 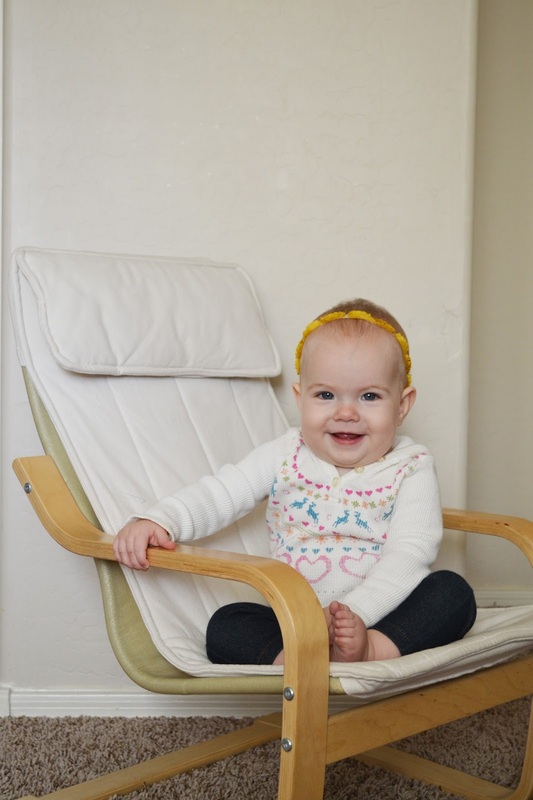 At her 9-month well baby visit, Clara's hemoglobin levels tested low. The doctor also wanted to look at her eardrums but couldn't see past a giant ball of wax. He gave me some instructions about how to remedy both problems and we're due back for a follow-up this week. I wonder if he'll say she needs ear tubes or not. I hope that issue has resolved itself. Clara is the happiest little girl. People can't resist commenting on her huge, blue peepers and strangers frequently stop me to tell me how darling she is. I totally get it -- she really is a cutie with quite a sunny personality. How could anyone ignore it? Now, PLEASE help me figure out how to get my baby to drink water! She just isn't having it and she's relying on breastmilk alone for hydration. I seriously need your help. Let me have it! Sorry, I don't have tips for water introduction. But, I'm here with the happy reminder that food has water too! Those mandarin oranges are packed with hydration! So maybe steer her towards high-water foods at first? Sorry if I double post! Are you offering water in a bottle? If you are, maybe try a supply cup? When my son was her age he loved drinking water from his own cup. Good luck!